"When May I Shoot a Student?" by Greg Hampikian in the New York Times. The 30-year trend is +0.17 °C/decade. The 15-year trend is +0.07 °C/decade (but has a large uncertainty, of course; see this nice plot by Tamino). The trend since last weekend is....sure to be quoted by some blogger somewhere or other as "proof" climate change isn't happening. Probably Patrick Moore. Well, he's not a co-founder of Greenpeace, as you often hear (and I mistakenly repeated two days ago). Just an early member. Patrick Moore founded Greenspirit Strategies Ltd. in 1991, a communications strategy firm that promotes energy-intensive industries including "mining, energy, forestry, aquaculture, biotechnology, pharmaceuticals and manufacturing," and supports "environmentally sound oil extraction, like is being done in the Canadian oil sands." "It should be remembered that there are employed in the nuclear industry some very high-powered public relations organizations. One can no more trust them to tell the truth about nuclear power than about which brand of toothpaste will result in the sexiest smile,"(9) he wrote before becoming a spokesman for polluters. Another ice spike showed up in my refrigerator freezer, the first one since last May. I almost feel honored. This says that internal variability, which Judith Curry likes to emphasize, is only about 1 part in 6. How do I know Moore purposely misled Congress? Because I corrected him on exactly this point on Twitter a few months ago. And he simply ignored all that science. 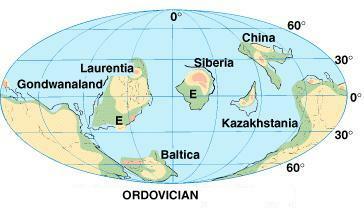 It is true that an ice age occurred about 450 million years ago -- the Ordovician–Silurian ice age. But little is known about CO2 levels at that time -- as I pointed out to Moore on Twitter -- and what's even more significant is that the Sun was weaker than by about 4%. And the continents were in different places, meaning the planet's albedo was very different from today. Moore ignored all this in order to pretend that the O-S ice age means CO2 is an insignificant greenhouse gas. The Sun's irradiance increases by about 1% every 110 million years. (See the top equation on page 4 here, or Pierrehumbert's textbook pg 12 equation 1.1.) 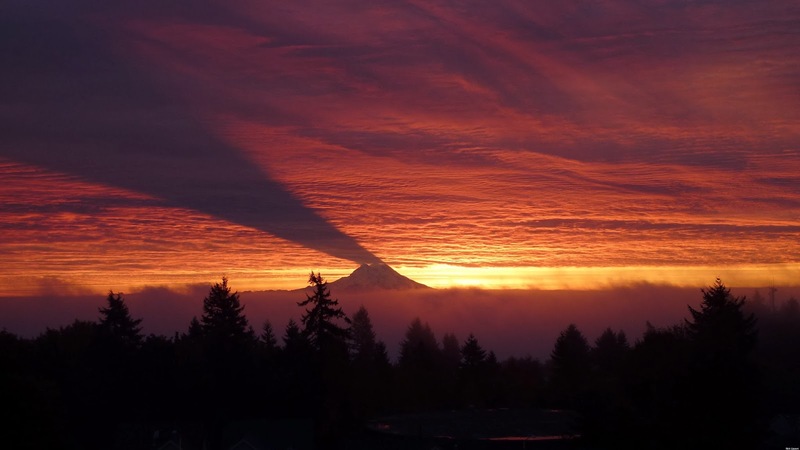 So 450 million years ago there was about 54 W/m2 less sunlight impinging on the top of Earth's atmosphere. That's a huge amount. By comparison, recall that anthropogenic CO2's radiative forcing is now only about 1.9 W/m2. The continents were in places nothing like where they are today. The Earth's albedo (reflectance) would have been signficantly different. or CO2 = 1640 ppm. That's with no albedo change (unlikely), just to get the same average global temperature as today (which includes our ice sheets). The problem is, there is very little data from back then -- proxy data points are about 10 million years apart -- and these curves come from carbon cycle models, which are much more uncertain than, say, today's climate models. This excellent review article by Dana L. Royer of Wesleyan covers CO2-forcing during the Phanerozoic -- the last 541 million years of Earth's history. intervals are 100 M yrs backwards. The best-regarded model of this class that predicts CO2 for the full Phanerozoic is GEOCARB, which has a time-step of 10 my (Berner and Kothavala, 2001); this means that CO2 fluctuations operating at timescales shorter than 10 my may not influence GEOCARB. 10 million years between time steps. A huge amount can happen in 10 million years. 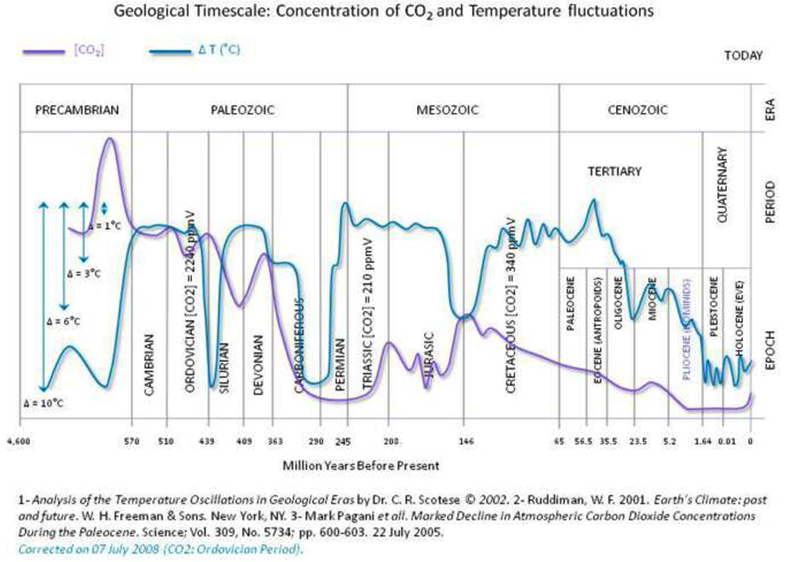 Look how much CO2 changed during the PETM, and that was only about 200,000 years. By the way, the O-S ice age lasted only 0.5 M yrs. In fact, Royer says that 4% lower sunshine means the glaciation threshold rises from 500 ppm today to 3000 ppm then. Dr. Patrick Moore completely ignored that knowledge. So the cartoon is very misleading, without error bars in either the vertical or (especially) the horizontal direction. Moore ignored all this. He wanted to paint a certain picture -- that CO2 is not very relevant -- and he was doing to do that with or without science. In this case, mostly without. These are the kind of rogues we have testifying before Congress on the most important issue of our day. Update: SkS wrote about the O-S ice period here. The Yale Forum on Climate Change & The Media is published by Yale Project on Climate Change Communication, Yale School of Forestry & Environmental Studies, 195 Prospect St., New Haven, CT 06511. "I checked with Tim Ball and the Ball lawsuit has not been dismissed. They have outstanding discovery requests, but to go from mere delay to succeed in a motion for dismissal is a large step and one that has not been taken." If "fraudulent" Isn't An Accusation of Fraud, What Is? My view of the case is unchanged. I think the statements Mann attacks are best viewed as opinions expressed through vivid rhetoric and hyperbole, rather than statements of literal fact susceptible to defamation analysis. That view is strengthened by the steady progress of the law since 2012 in cases like Cox v. Obsidian Finance, which I discussed last month.1 The tone and rhetorical flair of the statements, the places they were published, and their entire tenor strongly suggest they were argumentative opinions rather than falsifiable statements of fact. Therefore, they ought to be absolutely protected by the First Amendment. (My emphasis.) So if calling Mann et al's work "fraudulent" is just "vivid rhetoric and hyperbole," what would you have to call it if in fact you thought it really was fraudulent? So that makes three: in 2006 in The Australian, in 2009 in National Review, and in 2012 in NR. Virtually everyone accepts the overwhelming evidence of human influence on climate change and the urgent need to address it, except for a handful of hardened skeptics and those who benefit financially from less regulation. which for some reason Steve Milloy and Marc Morano find to be a "whopper." For that matter, so does Mark Steyn.... The American Geophysical Union often holds its spring conference in Boston. Wonder if he will attend to see what all the fuss is about....? What was known about the "Medieval Warm Period" before Mann et al and others did their reconstruction work in the 1990s? Not a whole lot. At least, not as portrayed in the IPCC's First Assessment Report. Is it hooey? I can't vouch for the quality of Steyn's science education, but that picture of the MWP is not what the IPCC wrote on their First Assessment Report in 1990. In the FAR Chapter 7, page 202, they gave the figure to the right. 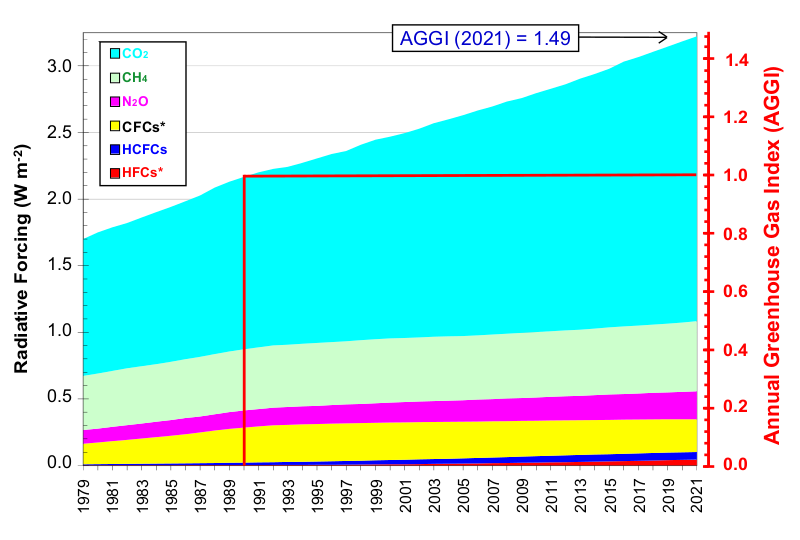 Notice there isn't even a scale on the vertical axis (the IPCC calls it a "schematic diagram"). In other words, there wasn't a lot known then, and there were cold regions as well. They refer to only two papers, both of which pertain mostly to Europe. So Mann et al didn't "eliminate" anything -- they provided illumination where before there was much darkness. There just wasn't a lot known about the MCA (Medieval Climate Anomaly) before people started seriously collecting and understanding proxy data, and the theorists then started to analyze it. On Thursday, February 27th from 10:00-11:30 EST, you're invited to join the US National Academy of Sciences and the UK's Royal Society for the release of Climate Change: Evidence & Causes . Written by a UK-US team of leading climate scientists and reviewed by climate scientists and others, the publication is intended as a brief, readable reference document that addresses some of the questions that continue to be asked. Miles O'Brien of the PBS Newshour will moderate a discussion between some of the authors and the audience. Participants can join in person at the NAS building on Constitution Avenue & 21st Street, NW, or by webcast. Coffee service begins at 9:00 a.m.
Register today to attend in person or view the webcast. To celebrate the release of this publication, the National Academies Press is offering a 25% discount off the list price of the reports in our climate change collection. Just enter discount code CHANGE at checkout. These reports are also available as free PDF downloads at NAP.edu. You're receiving this notification because you signed up for information on new reports from the National Academies Press. © 2014. The National Academies Press. Last month was the 4th-warmest January globally, said NOAA, after 2007, 2002 and 2003. Cold in Russia and eastern North America, but warm nearly everywhere else. Look at Greenland. Tom Russell, meteorologist for WHP CBS 21, apologized Wednesday after he tweeted a comment about Penn State Climatologist Michael Mann which apparently upset some residents of the twitterverse. Stepansky and other Twitter users took exception to Russell's comment, who later issued – via Twitter – an apology to Mann. In a separate tweet, Russell said "My intention wasn’t to question his credibility, only to express that there is a range of opinions on this topic. " Mann accepted Russell's apology, thus ending the short-lived discussion. It is too bad that the Michael Mann v Mark Steyn case doesn't involve Shirley Temple or Buddy Epsen -- where clearly Steyn's real passions lie. Steyn might then actually have a chance of winning. Unfortunately for him, it's about defamation and it's about science, about which Steyn knows little. And he demonstrates this with every post he makes on scientific topics. Science advances through dogged contrarians testing the "settled science", not through glassy-eyed consensus acolytes prostrating themselves before "one proven answer". This is just wrong. Worse, it's silly. Science does not advance by testing "settled science." There are no scientists today testing Newton's laws with ever more precise micrometers. Geologists do not repeatedly do analyses to confirm or deny the theory of plate tectonics. No one is yet again measuring the mass of the electron, to be sure it's isn't wildly different from the consensus number. Science advances by testing the edges of knowledge, where things are still not settled. Scientists -- real scientists -- accept the existence of, say, he greenhouse effect -- because that's what the evidence shows. They aren't endlessly verifying its existence or replicating the evidence for it -- what would be the point, any more than doing endless lab bench experiments on colliding marbles to see if energy is conserved. In fact, there are essentially no "dogged contrarians" (Steyn's term) in science, because they invariably look like poseurs and fools and real scientists don't have time for such people. Because such people aren't intellectually serious. Being a good scientist is, to a very significant degree, about knowing where to look for problems -- about understanding what has been proven, and then going to its edge to test and probe for weaknesses, deviations, and new phenomena. But these only occur at the edge of scientific knowledge, never at the middle of scientific knowledge. This is a very real and very large part of why science has been so successful for the last 400 years -- when it knows something, it knows it. It doesn't spend endless time repeatedly confirming old knowledge, as if the second law of thermodynamics is true only by opinion, like what is the best Frank Sinatra song. Opinions change. Bodies of scientific knowledge don't. This is something contrarians usually get wrong. Michael Crichton liked to say that consensus had no place in science. Wrong! There is consensus all over science -- about Newton's Laws of Motion, the Laws of Thermodynamics, the existence of quarks, the basics of radiative transfer, and countless other things. If there is new knowledge to be found, it will be at the edges of existing knowledge, not at its middle. Maybe Newton's laws don't hold over scales larger than galactic. Maybe quarks behave unusually at very high densities of quark-gluon plasmas. Maybe internal climate variablity occurs a little more rapidly than models simulate. But the basics are sound. Ken Caldeira said recently, "...we have as much confidence in the basic climate science as we have in the fundamental science of plate tectonics or biological evolution." Go to any science conference, and you will hear what scientists are talking about -- it certainly isn't an endless rehashing of the basics. There is consensus about the basics: CO2 is a strong greenhouse gas. It causes at least 2 C of warming when doubled. 2 C is a lot of warming. This is the "settled science." And what's unsettled -- perhaps, as many lines of evidence suggest, equilibrium climate sensitivity is more like 3 C, or even larger -- isn't necessarily reassuring. Uncertainty cuts both ways, and its error bars are far more serious than those on Shirley Temple's greatness. Submit Questions Now for March 19 Webcast: "Tracking Carbon In A Warming World"
Britton Stephens "Tracking Carbon In A Warming World"
As carbon dioxide in the global atmosphere continues to rise, a historic monitoring program is threatened with funding cuts. How do we track the carbon cycle today, and what would the loss of the Mauna Loa record mean for our ability to track our changing climate? "The Challenges of Climate Change Communication"
"2014: The Year Ahead in Climate Change News"
Journalists, scientists, researchers, educators, and others can subscribe to this listserve by visiting us online at The Yale Forum. If you wish to unsubscribe, send an e-mail with "UNSUBSCRIBE ME" in the Subject line. Your e-mail address will be used for purposes of this listserve only. We do not distribute, sell, or provide any customer information to third parties without your prior consent.